Kavyaa Rizal ’17 puts the sociology theory she learned into practice as a program officer for a nonprofit that empowers women. 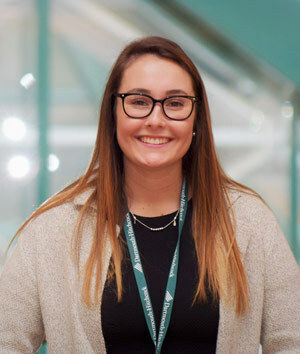 Talia Hardy ’20 develops connections with community partners to encourage blood donation at Dartmouth-Hitchcock Medical Center. People are fascinating — even more so in groups. With a degree in sociology from Colby-Sawyer, you’ll study the dynamic relationship between individuals and society to understand why people act, think and feel the way they do when they come together in small and large groups. Gain a strong theoretical background in sociology with macro and micro approaches through the study of diversity, the influences of culture and social structure, and the pervasiveness and causes of injustice and inequality. Explore the reciprocal relationship between individuals and society as well as how human experience is affected by social change and stratification, institutions, race, ethnicity, gender, sexual orientation, age and class. Participate in research alongside faculty and like-minded peers to publish your findings in sociological journals and present your work at professional meetings like the annual conference of the Eastern Sociological Society. A Capstone project during your senior year offers experience designing, investigating and presenting research in a topic of interest. Collaborative research, data analysis and service learning, along with a required internship at the organization of your choice, combine to provide practical experience and valuable career skills. A minor in sociology can be combined with any baccalaureate degree. See the college catalog for specific requirements. Integrate community service with academic coursework through service learning — a key component of Colby-Sawyer’s sociology program. Develop your own service leaning project or choose from a variety of opportunities at organizations like the New Hampshire Food Bank, the Sullivan County Department of Corrections and the Kearsarge Area Food Pantry.